Owing to their practicality among all passengers and logistics personnel, taxi websites have become one of the most frequently visited Web pages online. Passengers need not to physically go outside in order to find their ideal car that would transport them to their destination. 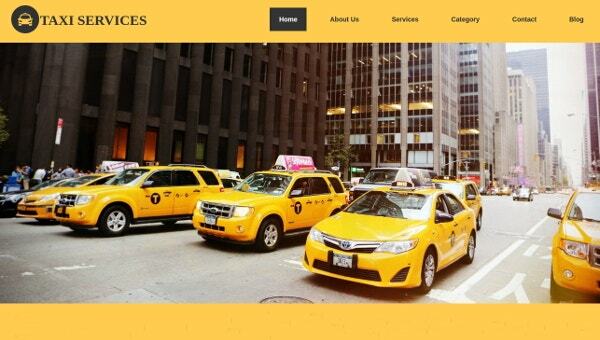 A series of taxi and transportation website for booking or rental, which are being featured in this post, are suggested for consideration by taxi companies or operators. Check out what we have to offer below. 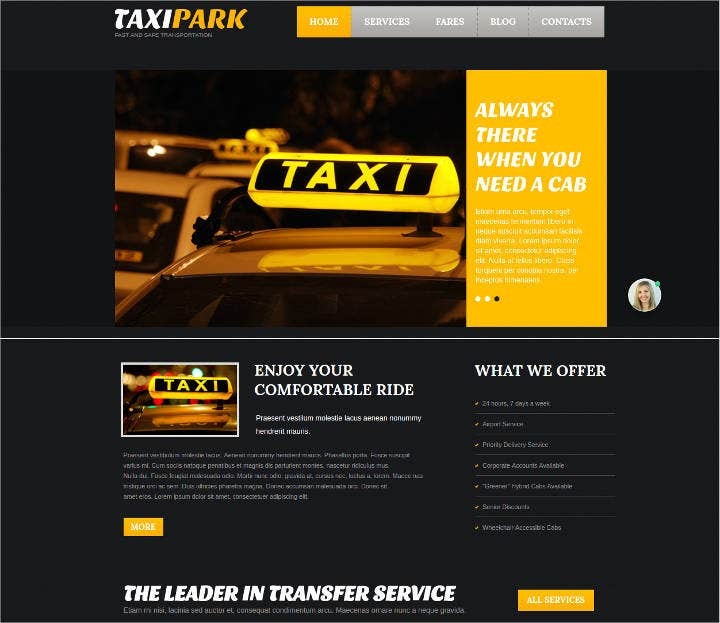 This is an HTML template whose web design is simple yet its contents are perfect for passengers and operators alike. Here, passengers do not need to go through pages since all they have to do is fill up the bottom right portion with their name, telephone number, and physical address. 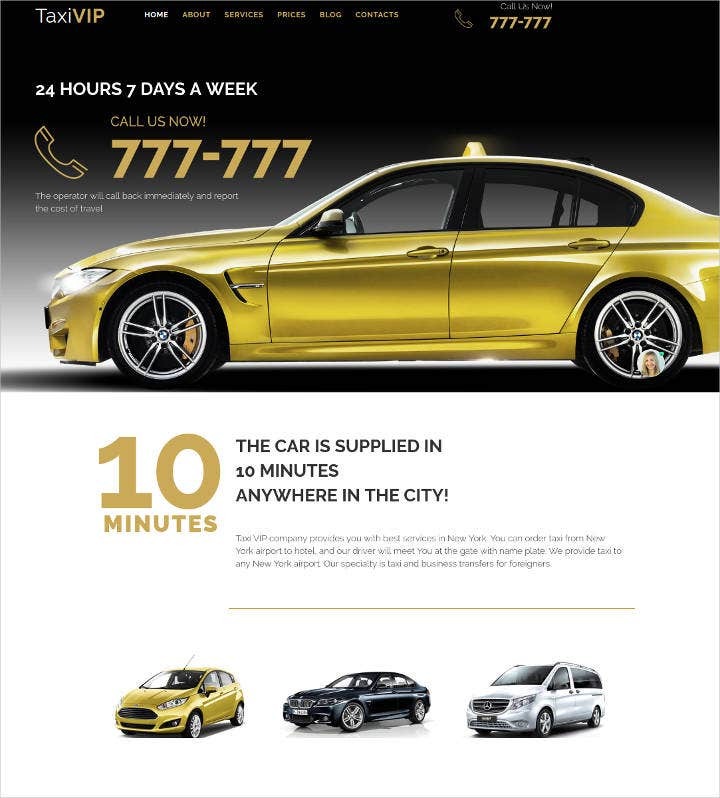 This is another cab website design featuring a number of taxi images on the cover, giving the impression to riders that the page caters to taxi transport services. 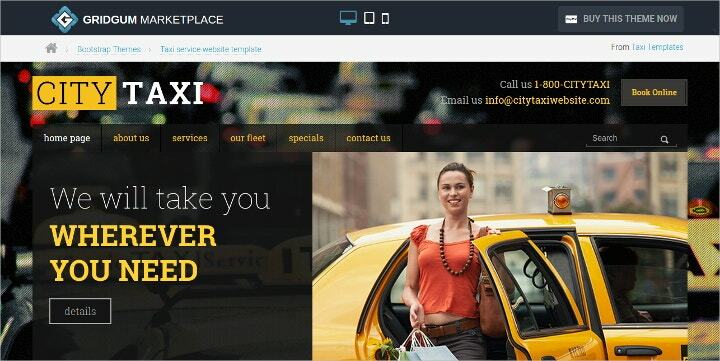 Unlike “Taxi Company template,” “City Taxi” provides users extra time to browse the pages by requiring a number of mouse clicks first. 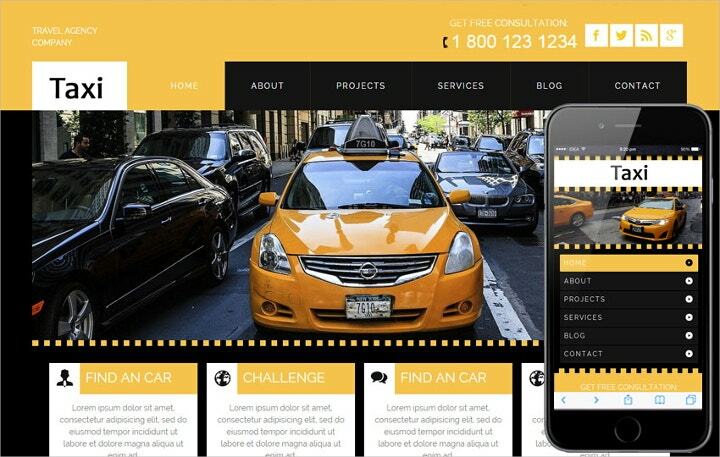 This template is ideal for use by taxi users and operators because its content suggests providing no other transport services than the taxi itself. 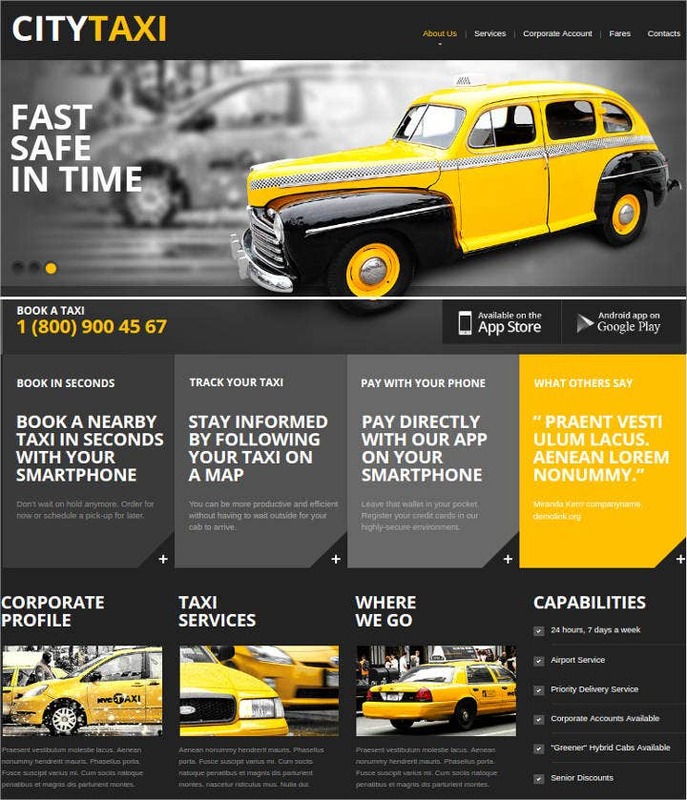 The image of a taxi at the center is catchy for taxi riders to consider the page automatically. What makes this template remarkable is its main cover emphasizing the contact numbers for the riders to call in order to get a cab. 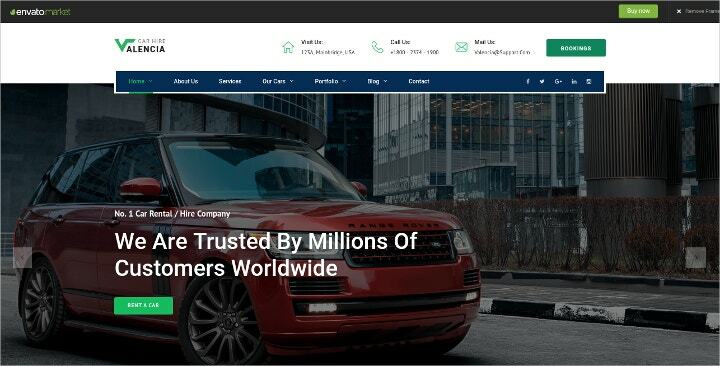 They need not to go through the page to contact the operator; however, they can spend a portion of their time checking the site as well since it offers some important details like the kind of services that they can further avail from the company. 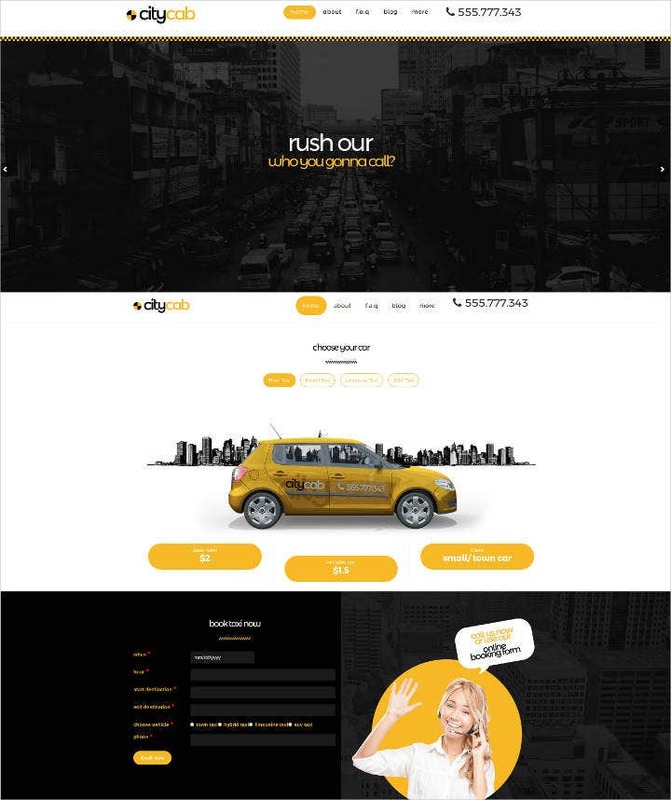 This is another taxi website layout whose features will definitely provide convenience to both taxi operators and cab riders. The layout is strategically successful in not only as a means of communication between the rider and the operator but also in marketing the brand. 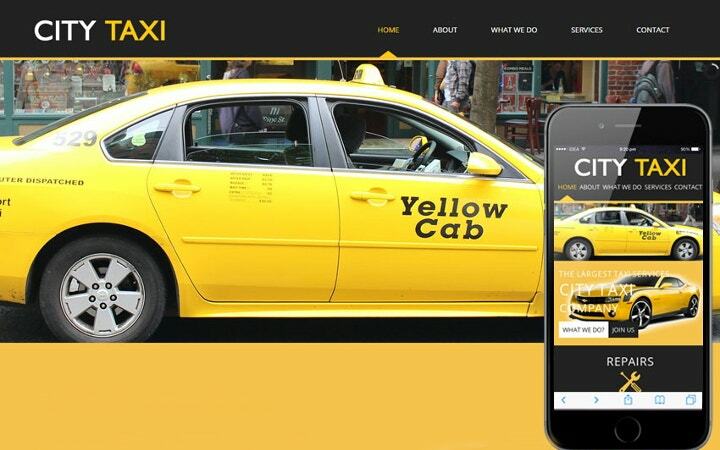 This yellow-and-black theme is specifically designed for taxi riders and mobile users in one. Easily downloadable on mobile, the design would surely provide riders 101 percent convenience wherever they are. 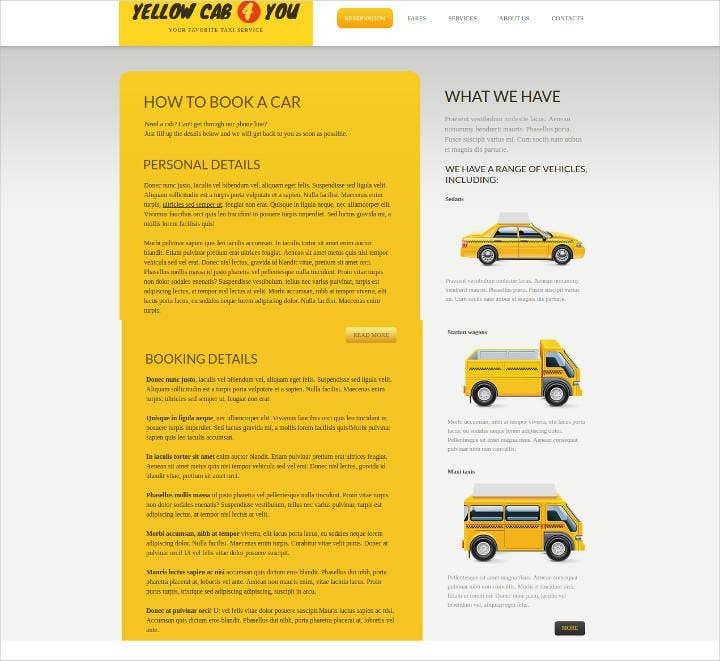 This is one example of a taxi Web template which functions using Cascading Styl Sheets (CSS) technology, thus making it practicable for all riders to view in appointing a taxi regardless of their browser. An ideal website of its kind, the template is fully designed on a bootstrap basis and is perfect for mobile applications. It is highly customizable for all taxi operators to input all the required information on a specific portion. The design is perfect for companies and operators offering car rental services to the riding public. Here, riders who have limousine or other private cars in mind as their means of transport to their specific destination would likely to consider this page. 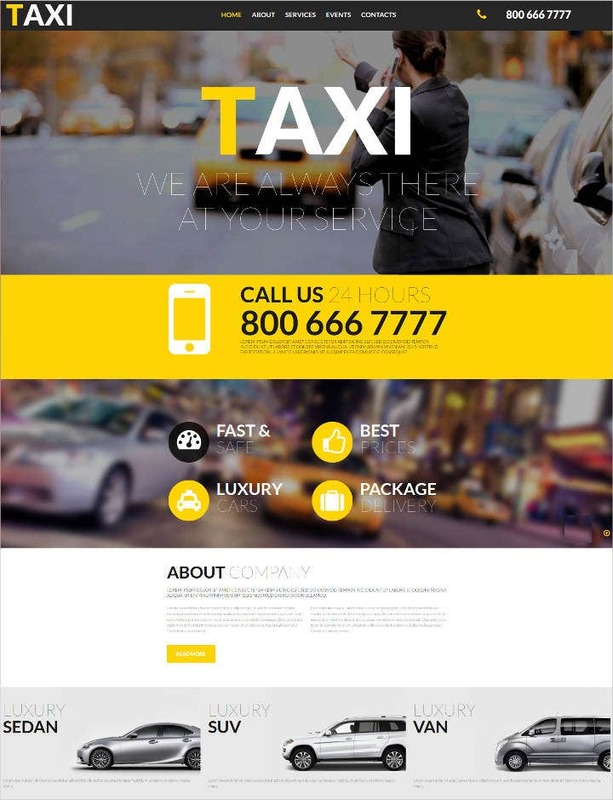 Another taxi website template, “Taxico design” readily offers both the taxi company and the cab rider two options—for the rider to contact and get the operator’s services online or phone call and for the operators to cater to their riders either by phone or by online as well. The highlighted “Book a Car” on the homepage is a direct and crisp representation of this template. One HTML website, the booking template would likely attract riders in need of a reliable service to take them from point A to point B. Operators and taxi riders who consider telephones and cell phones as their main means of communication would likely to consider this template as this does not require online connection in order to serve and be served. This is considered as an up-to-date Web design template, considering its use of HTML5 standard on its operation. 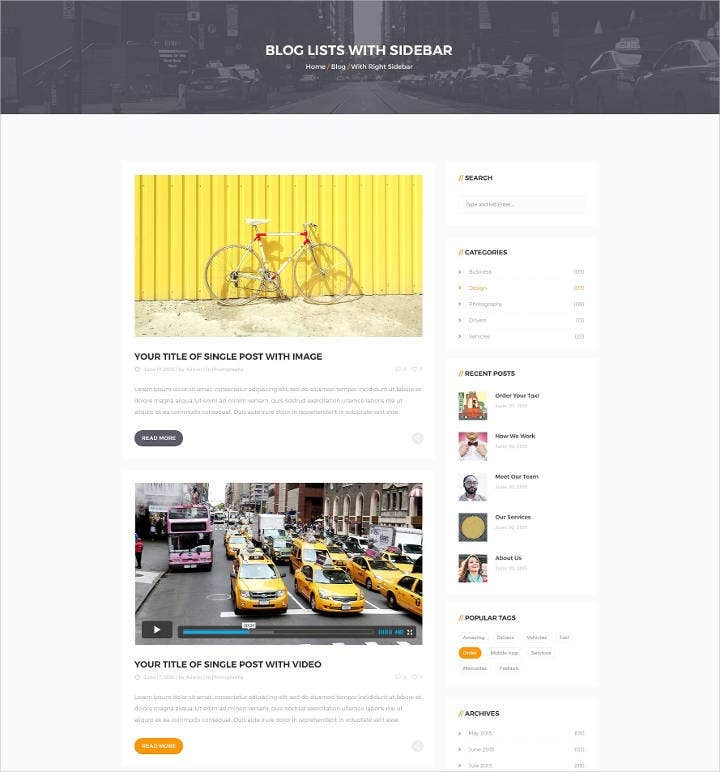 This is ideal for users who want to connect with a responsive website. Each template is different from each other considering its Web designs, focus, and emphasis in nature. Nevertheless, all templates are effective in their respective ways, and it is up for the Web designer or developer on how to further improve each template by adding more designs and details. Template.net offers more tips and how-to guides about website design and development, so check them out!